Welcome again to our 4 day Sicily itinerary! Last week we reached Mount Etna and Catania. We walked up until the crater to see Etna snorting and then down reaching the marveillous city of Catania. It was the first day of a 4-day tour among the Unesco World Heritage sites in the south-eastern part of Sicily. If you continue to follow us until the end of our tour, we have a gift for you: you could download our 4-day itinerary and print it to travel through it on your own. Now it’s time to move on and discover other two fascinating places I visited during our tour. We left the Katane Palace Hotel, a 4-star hotel in Catania, and continued our tour. Cicero described Syracuse as “the greatest and most beautiful Greek polis” in Sicily in the 1st century BC. Passing through the Campi Leontini – rich in historical traces, heading to Syracuse it is easy to abandon yourself to emotions. Syracuse is the ideal city for those looking for art. There are many art itineraries to follow through museum collections and monuments, parks and churches. Syracuse was founded at the end of the 8th century BC by colonists coming from Corinth. The city was built in 5 quarters. One of these is the Neapolis, which today is an archaeological park. It was our first stop in Syracuse. 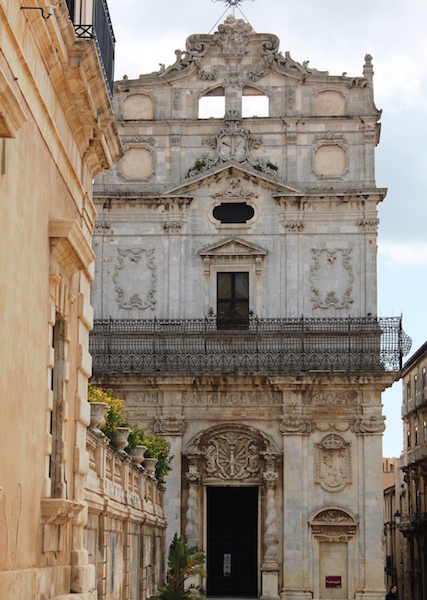 The Church of Santa Badia alla Lucia in Ortigia is an example of the Sicilian Baroque. the Ara di Ierone II, according to some people is the greatest sacrificial altar in the Mediterranean area. Syracuse means “living the island in the island”. In fact the first settlement of the city was on the small island called Ortigia. Today Ortigia island is connected with the mainland (Sicily). Its extension is less then 1 square kilometer and only 4,500 people live on it. The island of Ortigia is full of mosques, temples and synagogues transformed into churches. The conversion to Christianity dates back to the 6th century AD. Duomo di Ortigia and Palazzo Comunale Vermexio are 2 examples of that – they were holy places for Athena and Artemis. Among the monuments and palaces of the Middle Ages you can find paintings and sculptures realised in Gothic, Renaissance and Baroque style reminding the painter Caravaggio. 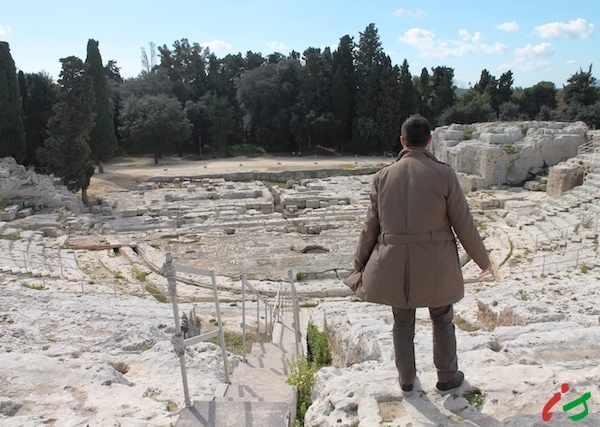 It is amazing to get lost during the discovery of the city of Syracuse, that overlooks the sea. The city preserves important artworks, like the “Annunciazione” painted by Antonello da Messina in Palazzo Bellomo, or “Seppellimento di Santa Lucia” painted by Caravaggio for the Church of Santa Lucia alla Badia in Piazza Duomo. Visiting Noto in the afternoon is without doubt a stroke of luck, because the monuments get gold by the sunset lights. Noto is called “the garden of stone”. It strikes each visitor for the enchanting and aristocratic atmosphere and for its warm colours given by the honey coloured stone. It is a place where art and culture live together and in 2002 it was declared Unesco World Heritage site. Among all the cities in Val di Noto destroyed by the earthquake of 1693, Noto is considered the chieftown of the Sicilian Baroque style. The earthquake flattened the ancient city, of which only scattered ruins, on the Alveria hill, remain. The city you visit today was completely built at the end of 17th century. Driving along roads inbetween citrus groves, olive tree groves and almond tree groves is enchanting. Walking through boulevards inside the city gardens is relaxing and you can admire the many pinkish (sometimes goldish) churches, monasteries, cloisters and palaces. Each view or glimpse is intensely panoramic and you will feel a pleasant well-being walking along the streets. You have to walk looking skywards to catch the explosion of decorations, stone intricate work, statues, rounded balconies and wrought iron grid on majestic facades. 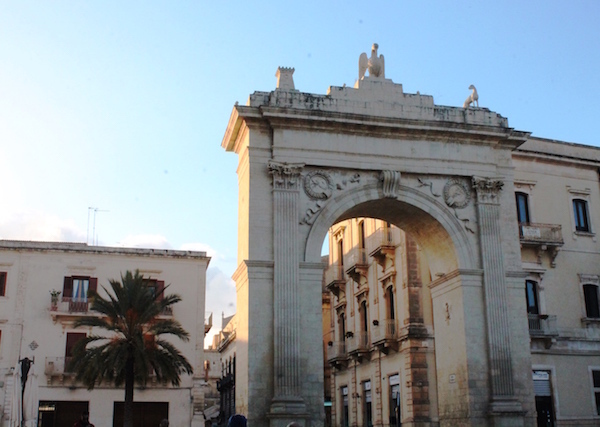 The majestic entrance to the city of Noto, one of the stops of our 4-day itinerary. Walking from San Francesco Church and the simple but elegant Santa Chiara church or from San Salvatore church, you reach the Cathedral on top of a monumental staircase and in front of Palazzo Ducezio‘s loggia. What strikes the visitor is the extraordinary harmony of the whole area. The balconies of Palazzo Nicolaci along the road with the same name are unique: original creations of the local masters with big masks, curvy marmaids or winged horses, which fascinates each pedestrian walking under them. One of the most famous event is the Infiorata di Noto. The event is held on the third week of May (2016: from 12th to 15th) and colour the town with a wide variety of flowers. Along the streets artists create carpets made of flowers. It is quite a welcome to the good season. Along the Salita del Principe there is a long multi-coloured flower carpet that every year has a different subject. The result is extremely picturesque. Except the days of celebrations and events the atmosphere in Noto is relaxing and there is no crowd of tourists. Just outside Noto, going towards the sea, you can recharge you for the next stage of our 4-day Sicily itinerary. I wait for you next Friday to continue our tour. Don’t miss it! Where to sleep near Noto: Poggio del Sole Resort – Marina di Ragusa (RG). How to get to Syracuse: by plane you can land at Catania airport (45 minutes far from the city centre). By car from the north you can take the highway NSA 339 Catania – Siracusa, then the orbital road RA 15 and in the end the SS114 Orientale Sicula heading to Syracuse. If you come from southern Sicily take the highway A 18 Siracusa – Gela, if you come from western Sicily take the highway A19 Palermo – Catania (then RA 15 and SS114). How to get to Noto: by car you can take the highways A18 or A19 exiting at Bivio Cassibile, than taking the SS115 to Noto.